Looking for the ultimate in bathing luxury for your home? Consider incorporating the Wasauna Negative Edge Bathtub into your bathroom design. This strikingly beautiful contemporary bathroom fixture sets the standard for in-home spa bathing indulgence. One or two people can bathe in comfort, enjoying the relaxing sensations of the 21 all over massaging jets built in to the tub. 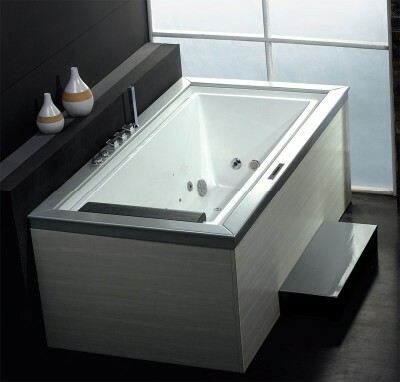 You'll be able to soak in maximum comfort, with the convenience of being able to access controls for the tub's jets and temperature from a digital touch screen panel mounted on the rim of the tub. There's even a built-in FM radio that you'll be able to control from the same panel. The tub's thermostatic faucet has a stopper at 100.4 Fahrenheit, which reduces the risk of scalds by keeping water that is too hot from getting into the bathtub. For even more bathing enjoyment, the tub includes chromatherapy features, allowing bathers to select from among seven different lighting schemes to set the mood and increase their relaxation while they soak away the stresses of daily life. You'll enjoy your Wasauna Negative Edge Bathtub for as long as you own your home, and you'll find that it adds appeal and value to the structure should you ever decide to sell it. Of course, with such luxury in your very own bathroom, chances are that you'll want to stay put -- or install the same tub in your new home after you move! For more information, see www.wasauna.com.